Please welcome Emma Trelles to LETRAS LATINAS BLOG. That is, readers will be able to enjoy her literary journalism as she begins to contribute occasional, hopefully semi-regular pieces to this space. The subject of her first contribution, in this case an interview, is the poet-critic Emily Pérez. 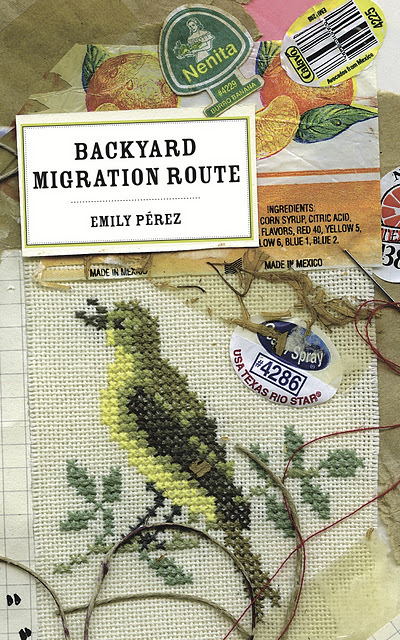 Emily Pérez grew up in the Rio Grande Valley of South Texas. She graduated from Stanford University with a BA in English and earned an MFA in poetry at the University of Houston, where she served as a poetry editor for Gulf Coast and worked as a writer in residence with Writers in the Schools. A scholarship recipient of the Summer Literary Seminars in St. Petersburg, Russia, and Bread Loaf Writers Workshop, she has also been a member of the Community of Writers at Squaw Valley. Her book reviews have appeared in Latino Poetry Review, American Letters & Commentary, and Gulf Coast, and her poetry has appeared in Crab Orchard Review, Borderlands, The Laurel Review, DIAGRAM, and other journals. 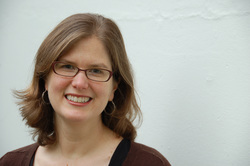 Her manuscript was a finalist for the Andrés Montoya Prize as well as a semifinalist for the Crab Orchard and Zone 3 prizes. 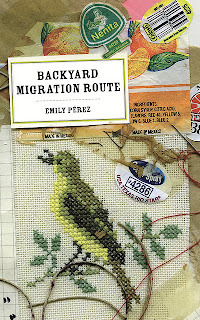 In 2011, her chapbook, Backyard Migration Route, was released by Finishing Line Press. She teaches English, poetry, and gender studies in Seattle where she lives with her husband and son. In this interview, conducted over the phone one afternoon last December, Pérez talks about the serendipity of publication, unintentional passing, Elizabeth Bishop, podcasts, and how fairytales are helping to shape her newest manuscript. ET: This is your first collection of poems, and I'm wondering why you decided to publish a chapbook instead of holding off for a full-length collection of poems. I am enamored with the chapbook for a lot of reasons: it feels more like a unexpected find than a longer collection, a more personal artifact, as if there is less separating the reader from the writer. Chapbooks are also often little works of art, as yours is with its slim green ribbon and photo-collage cover. Did this medium's particular sense of intimacy and visual impact inform your decision to publish in it? Were there other factors? I could only see how the poems would work after they had taken that shape. And I sent it out to see what would happen, essentially, at a friend's prompting, who is not in the poetry world but in the book arts world. A book artist pointed me in the direction of the chapbook. ET: That really speaks to the importance of creation and artistry above marketing and placement. There's a real sense of purity in that. EP: Right; I certainly did not have the marketing in mind when I started this. It was going to be a one-off piece. I sent the chapbook to two places and it got picked up. I sent it out never really expecting it to be published; I really didn't think it through about what would happen if it was selected. I put something really intimate into the world without the thinking about it. I realized afterward that I might have made my parents overly exposed, but I didn't particularly feel that way during the process. and would not say its name. its hands upon its lap, feet under its seat. to it in slow, loud tones. We shut it up. I won’t say how. We gulped it down. It won’t go down. We speak and hear its voice. ET: Can you explain a bit about your background and how where you come from, so to speak, reveals itself in these poems? EP: My mother is white and my father is Mexican-American. I grew up in the Rio Grande Valley in South Texas. Growing up we were the only family that I knew with a mixed heritage. And it wasn't something I was very conscious of for many years. I became more conscious of it as other people made me aware of it - like schoolyard bullies and people like that. In my town there was a lot of segregation that I didn't recognize until I was older - where people lived in town, class segregation, racial segregation. My family was in this weird position of being Mexican but not totally Mexican. My dad's family has been in this area for several hundred years, but here my siblings and I didn't speak Spanish and weren't Catholic. Yet we thought of ourselves as Mexican Americans and overall we led very privileged lives compared to other people in our community. It is the beauty of a small town was that every one knows your family - so some of these questions about who you are and what you are didn't appear, like questions about my last name. It wasn't until I left home, to boarding school in New Hampshire, where my name became an issue. I would tell people my last name and they would correct my pronunciation. I became privy to people's racism because they weren't aware of my background and made comments to me thinking I would be sympathetic to them. ET: How did this experience impact you as a poet? EP: It made me start thinking about how I did and didn't fit in. I was writing poems in boarding school about typical teenage heartbreak, but it wasn't until college that I started writing more about where I was from. Then, after college, I started writing more about this cultural merge, and then thinking about the Rio Grande Valley as this amazing place of border crossing, all the different kinds of borders, the physical, the social. I wanted to start playing with this idea, and it led me into the poems in this collection. And also, it got me thinking from the very macro scale of the US/Mexico border, and from the very micro scale between a father and a daughter, how he grew up in a Spanish speaking household and I grew up in an English speaking one. We needed to make it here and the way you do it is to speak English. For my generation, it's such a loss– why didn't we speak Spanish? ET: It's interesting to hear you speak about similar experiences as my own. Our backgrounds are regionally and ethnically different, but some of what you talk about has happened to me as well, particularly the cultural and personal politics that accompany assimilation. Do you ever feel as if you are not Latino enough for the Latinos and not American enough for the Americanos? EP: Oh god, yes. I feel as if I'm in a constant state of unintentional passing. The whole world sees me as white, and I get all the privileges of being white for looking the way I do. If I want my heritage to be recognized I have to assert it. I have actually been very well accepted by other Latino writers in person, although I don't know what their secret thoughts are! My subject matter is not politically or socially affiliated with heritage so I think I wouldn't be your first pick for a Latina poet, but the idea of not being Latino enough is not something that I've felt from other Latino writers. Latino poets are open to what the breadth of what that means. I don't feel it so much in the writing community but more in my day to day life. And I do feel it more within myself as a writer. I think this is something that all writers have - this feeling of being on the outside, looking in on things from an outsider view, not quite fitting in. A lot of that stems from my heritage, and for other writers it might come from elsewhere. ET: Let’s turn to the craft and aesthetics in Backyard Migration Route. The four poems that comprise this chapbook feel at both casually inventive and structurally formal, the latter primarily because you have presented so much music in these stanzas - internal and end rhymes, iambs, a cadence throughout that is reminiscent of song. Do you consider yourself a formalist of sorts? Do you also play music? Was it a part of writing these poems in some way? EP: I am not a musician, but I come from a family of musicians. My father plays several instruments and both my grandparents do as well. My older and younger brothers are jazz musicians, my husband is a musician. I've been surrounded by music in my life, although it wasn't something I was particularly successful at, even though I took piano, violin , and saxophone lessons when I was younger. In some ways I saw the poems as little conversation pieces but also as feeling complete in themselves. I hope that sound allows the fragments of each poem to stand alone and that the story is what pulls them together. Perhaps the musicality was a way for me of enforcing these smaller sections as a whole, whereas sometimes in a longer poem you can trust the cohesiveness to hold it together.. I don't consider myself a formalist in the way of people who submit poems to formalist publications. The form of “Field Guide” and “My Father” are ones that I started experimenting with in college. Elizabeth Bishop has a poem, “12 O’ Clock News” - she's listing items on a desk on the left hand side of the poem in titles. On the right hand side are these blocks of texts that de-familiarize the items on the desk. I had read her poem and thought it was really interesting. In the time I've been writing poetry seriously I've written a handful of poems in that form; it especially works for longer poems. I guess in that sense my own poems can be a formalist pursuit but not a formalist approach, as if I'm writing a book of sonnets. But it does take collage one step further. ET: Who were you reading while writing this book, and who are you reading now? Do you think poets should read other poets while working on their own poems. Why or why not? EP: Definitely. Now I'm trying to read whenever I have time to - that's the hard part, making the time. I am very drawn to musical poets. I don't know if I can say this for the blog, because it can seem shameless, but your book, for example– I thought it was very musical. And I also love Romey’s Order by Atsuro Riley for its musicality and for its family story, ironically, in part, about mixed race parents and a boy growing up with both white and Japanese parents. What I do regularly is listen to podcasts because that's something I can do while I'm taking the dog or the baby for a walk. I listen to NPR's poetry podcast and Poetry magazine's podcast. Those are great because you are often hearing the poets themselves reading their work. The musicality really comes through with the poet's own rendering of the poem. ET: It's also an exclusively aural experience of the poem. EP: Exactly. If hearing a poem makes an impression on you, that's the kind of poem I want to write. ET: You are also a book reviewer. What value do you think there is for a poet in writing reviews and articles about other writers? EP: Tremendous value. To write a review, you have to really spend time with a book and invest in it, not just for the first read and the superficial ‘What do I like? What sits well with me?’ You really have to think about the mind of the writer, how the pieces come together. I find that immensely satisfying. It's hard work but it forces me to stay with a book for a while and really explore it. I think that we can get that kind of close reading with a book through teaching it, discussing it, or writing about it. I think as an adult no longer in a formal writing community like I was in my MFA, it's one way for me to really engage in a book. ET: What is your next project? EP: Getting my manuscript published! I'm sending it out. It's called “House of Sugar, House of Stone,” a book about family, again, about the anxieties around having family and abandonment within family. It starts with some poems based on the fairy tale Hansel and Gretel, which turned into a very productive device. It helped with an organizational impulse within me because I felt that writing about this tale turned into a very productive exploration. Then, it launches into parenthood. The last poems in the book I wrote while I was pregnant, so there is a lot about the anxieties of motherhood and babies. For the next manuscript, I'm exploring poems about trying things and having unexpected outcomes, cause and effect. Some of the inspiration is watching my son grow up and daily learning. I'm trying to map some of that surprise onto my own life and experiences, looking at his process and trying to see what is analogous. I'm also interested in what could have been, and I’ve started a few poems about Red Riding Hood running off with the wolf. There's always been something very satisfying to me about existing forms and the way restrictions unlock possibilities. Emma Trelles is the author of Tropicalia (University of Notre Dame Press, 2011), winner of the 2010 Andrés Montoya Poetry Prize. She is also the author of the chapbook Little Spells (GOSS183), a recommended read by the Valparaiso Poetry Review and the Montserrat Review. The recipient of a Green Eyeshade award for art criticism, she has been a featured reader at the Miami Book Fair International, the O, Miami Poetry Festival, and the Palabra Pura reading series at the Guild Literary Complex in Chicago. Her writing has appeared in Best of the Net, Verse Daily, The Rumpus, Gulf Stream, Poets and Artists,& Newsday, the Miami Herald, and Organica. A contributor to LETRAS LATINAS BLOG and the Best American Poetry blog, she is an arts writer and teaches writing and literature in South Florida.